Quote from the Sutra in Forty-Two Sections. 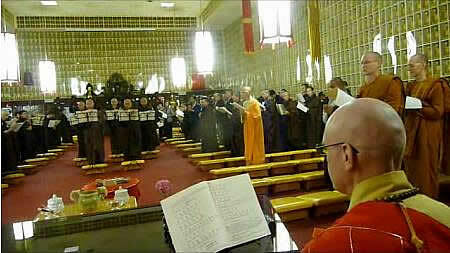 The opening ceremony of the 12th CTTB Monastic Trainee Program was held on the 15th anniversary of the Venerable Master Hsuan Hua’s Nirvana on June 21, 2010 at the Buddha Hall of CTTB. 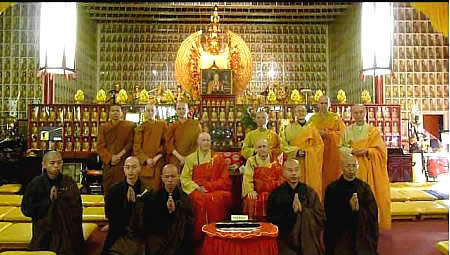 Five laymen, blessed by the Buddhas, Bodhisattvas, Master Hua, Four-fold Assembly of CTTB, as well as relatives and friends, formally entered the Trainee Program. Three Theravada monks from the nearby Abhayagiri Forest Monastery also came to show their support. The Monastic Trainee Program was first established in 1999 and is the first step for laymen aspiring to be a monastic in DRBA. 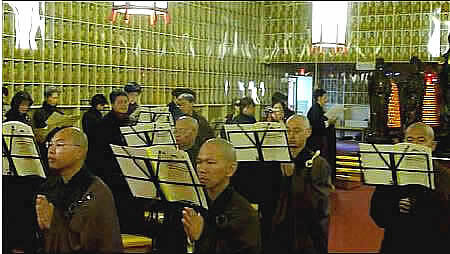 The trainees observe the eight precepts and eat only one vegetarian meal a day at noon. The program normally lasts 6 months. 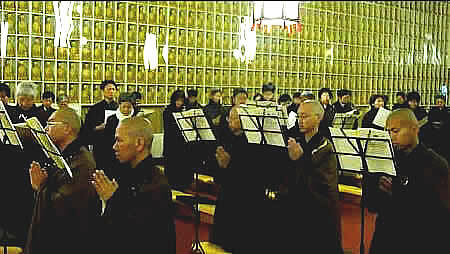 The trainees live with the monks in Tathagata Monastery under close guidance to prepare them for their next stage as novice monks after their graduation from the program. After another period of study and practice as a novice monk, they can then apply to become fully ordained monks, Bhikshus. 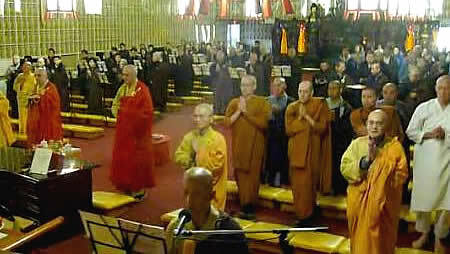 The two most senior Bhikshus in Dharma Realm Buddhist Association, Dharma Masters Heng Sure and Heng Lai on behalf of the Sangha led by Venerable Master Hsuan Hua presided over the Opening Ceremony for the Trainee Program. 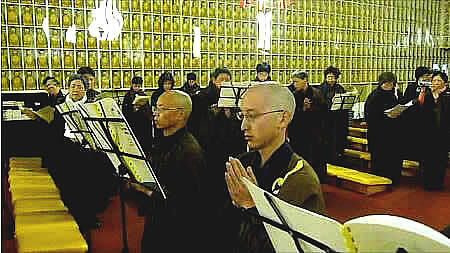 The ceremony consisted of requesting masters, repentance, taking refuges with the Triple Jewel, and transmission of the eight precepts and was concluded with instructional talks by both Rev. Heng Sure and Dharma Master Heng Lai. Rev. Heng Sure emphasized that this was the beginning of a transformation away from the world of outflows and pursuing individual desires to reflecting within, by gathering in the six senses, and living a life of service. The trainees were reminded that CTTB was an ideal environment for their training as they would be constantly reminded of the Dharma and surrounded by the Sangha serving as role models. 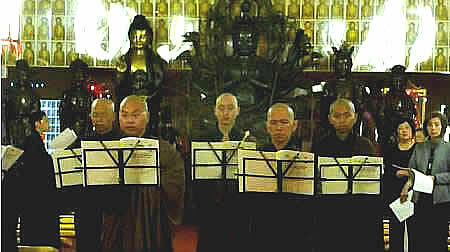 Dharma Master Heng Lai encouraged the trainees. He also reminded the trainees that they would encounter tests and obstacles in their journey and advised them to maintain their resolve to cultivate as they go forth in their vows. The five trainees came from various parts of the world and were: Yi-Soon Yap (Dharma name Guo Shun) from Malaysia, Tran Hong (Chin Ming) from Vietnam, Guo-Zhu She (Chin Zhu) from Taiwan, David Yin (Chin Wei) from the United States, and Yi-Fan Ping (Chin Shun) from China. 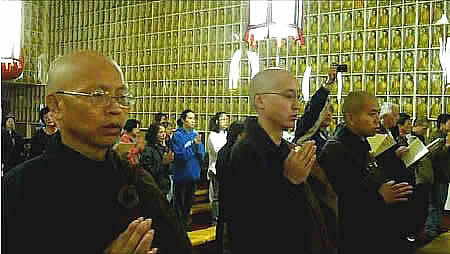 Coming from diverse backgrounds, they were united by their aspiration of wanting to cultivate the Way by renouncing the householder’s life and going forth into the monastic order. This 12th year of the Monastic Trainee Program is particularly significant as it is the most who have been admitted to the program at one time. The only other time there were five trainees was during the first year of the program in 1999. In addition, most of the trainees this year are quite young: four trainees are under 40 with two of them under 30. The addition of these young cultivators will certainly bring new energy to Tathagata Monastery and CTTB, and holds the hope of the beginning of a new era for the spreading of the Buddhadharma in the West.